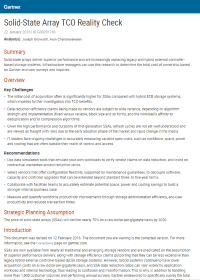 Read this report to discover why Gartner strongly advises that SSAs be considered whenever HDD-based storage systems need to be replaced. Are solid-state arrays (SSAs) worth the extra cost? IT leaders are facing ongoing challenges in accurately measuring variable opex costs, such as workforce, space, power and cooling that are often outside their realm of control and access. This independent survey of SSA users found that their deployments provided a positive ROI after only 5.4 months, significantly faster than hard-disk drive (HDD) storage systems.